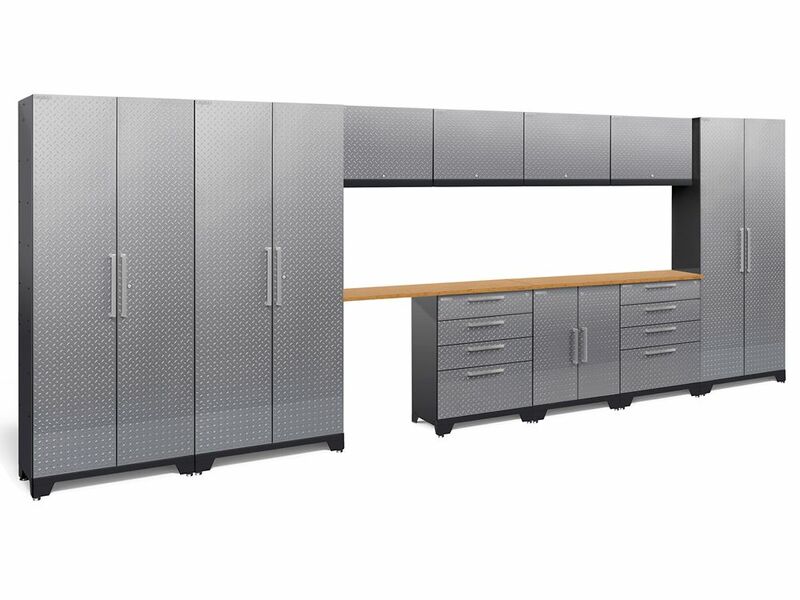 Performance 2.0 Diamond Plate Storage Cabinets in Silver (12-Piece Set) Get all those cables, decorations, and gardening tools off your garage floor and into NewAge Products newly redesigned, Performance 2.0 Series modular garage cabinetry. These cabinets are built to last with their fully welded, 24-gauge steel frames and fully lockable, double walled doors. Our configured sets are shipped with adjustable steel shelving; easy-to-grab stainless steel handles and height adjustable levelling legs that accommodate uneven garage flooring. The manufacturers limited lifetime warranty gives you the insurance that your cabinets will look great for years. Performance 2.0 Diamond Plate Storage Cabinets in Silver (12-Piece Set) is rated 5.0 out of 5 by 3. Rated 5 out of 5 by Mario from wonderful ! looks perfect in my garage , wont be disapointed ! Rated 5 out of 5 by Sylvain from Really nice cabinets Received the cabinets a couple of weeks after purchase. There was no apparent damage other than the bottom corner of one of the tall cabinets which was probably dropped before it was wrapped and shipped. Other than that, I am very pleased with the overall look of the cabinets. I had 12 pieces and it took me approx. 8 hours to do the install all by myself. I must say that the quality is better than expected. I was hesitating between Performance 2.0 and Pro-Series but now I think having made the right choice. Rated 5 out of 5 by Dino from Near perfect, met all the specifications Excellent. Two shortfalls. a) NewAge stickers keep falling off, need a better adhesive. b) 4 of the screws holding the dampers on the upper cabinets kept falling out. Had to buy some larger screws.